When Julie Chaisson put in a bid to become the Nova Scotia Progressive Conservative leader in 2018, she didn’t think people would see her differently because she was a woman. But on the campaign trail one thing became clear: people really cared about what she was wearing and didn’t seem to comment on what the men were wearing. Chaisson’s experience doesn’t appear to be unique. A study released last month by Equal Voice states 77 per cent of Canadians surveyed believe men and women are treated differently in politics. 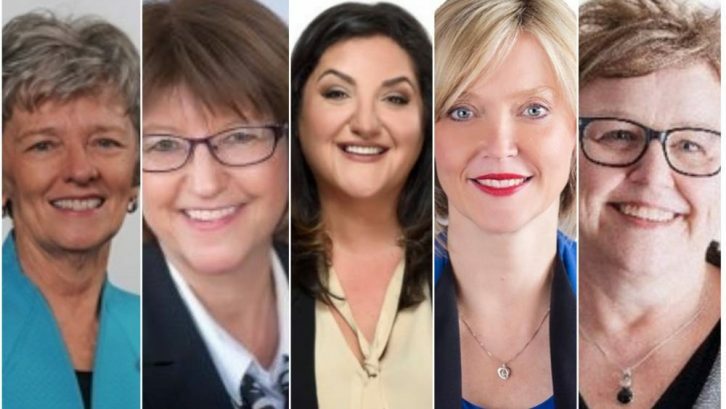 “Equal Voice has ample anecdotal evidence pointing to the fact that female elected officials are treated differently than their male counterparts,” Nancy Peckford, executive director of Equal Voice, said in a media release. Diana Whalen, former deputy premier for the Liberal government and MLA from 2003 to 2017, said women who are passionate can sometimes be deemed “strident,” a word she is not a fan of. On the other hand, if men are passionate about issues it’s seen as a positive thing. “I think we’re aware of it as women, so maybe we try to hold all that back,” said Whalen. In the early 2000s Whalen recalls overhearing men mocking things women had to say in the legislature. One phrase Alexa McDonough, the first woman to lead a political party in Nova Scotia, used a lot was “shocked and appalled.” Whalen said even after McDonough left politics, men would still use that phrase in a mocking way. When McDonough started in politics the legislature had a men’s only bathroom for MLAs. McDonough would have to use the public washrooms and stand in line with the women from the gallery. There were times she’d knock on the men’s door and tell them they had five minutes before she would be walking in. McDonough said there were men in the legislature who were “raging sexists,” but because it wasn’t televised in the 1980s people couldn’t see how outrageous it was. Is there a space for women? Elizabeth Smith-McCrossin, current Progressive Conservative MLA for Cumberland North, remembers a time when she felt out of place in politics. “I remember when I was 16, noticing that it was always older men that seemed to get elected. And I remember that really striking me and being annoyed,” she said. Smith-McCrossin got involved in politics because she was interested in it and was asked to by a member of Nova Scotia’s Progressive Conservative party. In 2000 she attended her first political meeting without being invited. She recalls being the only woman among about 15 men. Currently, there are more women in the Nova Scotia legislature than ever. There are 17 women out of 51 MLAs, including five in cabinet positions. The record for women in the cabinet is six, which was in 2015. Nova Scotia offers a campaign school for women to increase the numbers and diversity of women in leadership. It helps women prepare to run for office and other political ventures. Whalen said although things have come a long way since she started, women still feel they have to prove themselves. Whalen calls the legislature a “masculine environment” because there are many aggressive tactics used to knock someone off their game while they’re speaking. The Liberal MLA for Fairview-Clayton Park, Patricia Arab, agreed with Whalen. She said on occasion she has felt she was being treated differently. An example Arab used is in informal situations where older male members would “tame down” their conversations. Arab said, for women, there’s an added pressure to do and be everything. “Even if we don’t have that pressure around us, where people are making us feel blatantly, purposefully making us feel guilty somewhere inside of us, there is that guilt that we carry that we can’t be and do it all,” said Arab, minister of internal services and Communications Nova Scotia. Equal Voice reports one in five women have considered entering politics, but the number for men is almost double. A big reason for not getting involved is family obligations. Equal Voice found 74 per cent of women cited child care or household responsibilities as reasons not to get involved. “The fact of the matter is there weren’t very many men encouraging their sisters or their mothers or their wives to do it (run for election),” she said. Smith-McCrossin said she waited until her children were grown up. Being from rural Nova Scotia meant she would be away from her family for large chunks of time working in Halifax. Whalen said she lived in the old district of Halifax Clayton Park, a district close enough to the legislature she’d be able to take care of her kids and any political duties. McDonough discovered one of her barriers turned into a positive experience. While waiting for the public washroom, other women would give her tips about issues she had talked about, or other things happening in the community. Chaisson has hope that more women will enter politics. “We may run against each other and we may be on opposing sides, but we recognize as women in politics that we want to be able to have more women feel like this is something that they can do,” she said. McDonough finds it sometimes didn’t seem like party lines mattered. “You’re not just speaking for yourself, that’s what’s interesting about it. It is challenging, a bit daunting, but it’s also very rewarding,” said McDonough.